With the prediction that by 2020 Big Data and Internet of Things will be used to reinvent, digitize and eliminate 80% of business processes, learning the skills for navigating within these environments is of most importance. 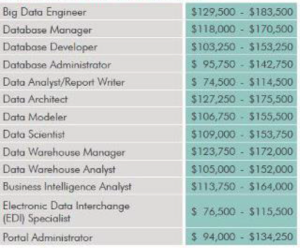 If you are employed and are pursuing either the Big Data Science Professional Certification or the Big Data Architect Certification, your employer could apply for the Canada Alberta Job Grant, which allows the employer to be reimbursed for 67% of the cost of the courses. (CRN’s The 2017 Big Data 100, May 1, 2017). Do you want to help organizations with using their data for making smarter business decisions? Increase sales! Improve efficiency! And much more. In this big data course you will learn analysis practices and technology concepts and mechanisms that comprise and are featured in contemporary Big Data environments and tools. You will also understand the business implications, benefits and challenges of adopting Big Data platforms and working with various tools. Furthermore, you will possess the ability to recognize appropriate analysis techniques and to associate them with the correct problems and requirements, in addition to possessing a fundamental understanding of the underlying mechanics of Big Data technology platforms and mechanics. Understanding Big Data, Fundamental Terminology & Concepts, Big Data Business & Technology Drivers, Traditional Enterprise Technologies, Characteristics of Data, Dataset Types in Big Data Environments, Fundamental Analysis and Analytics, Machine Learning Types, Business Intelligence & Big Data, Data Visualization & Big Data, Big Data Adoption & Planning Considerations. Big Data Analysis Lifecycle, A/B Testing, Correlation, Regression, Heat Maps, Time Series, Network & Spaitial Data Analysis, Classification, Clustering, Outlier Detection, Filtering, Natural Language Processing, Sentiment Analysis, Text Analytics, File Systems & Distributed File Systems, NoSQL, Distributed & Parallel Data Processing, Processing Workloads, Clusters, Cloud Computing & Big Data, Foundational Big Data Technology Mechanisms. Data Science, Data Mining & Data Modeling, Big Data Dataset Categories, Exploratory Data Analysis (EDA), EDA analysis types, Essential Statistics, Statistics Analysis, Data Munging & Machine Learning, Variables & Basic Mathematical Notations, Statistical Measures & Statistical Inference, Distributions & Data Processing Techniques, Data Discretization, Binning, Clustering, Visualization Techniques & Numerical Summaries, Correlation for Big Data ,Time Series Analysis for Big Data. Statistical Models, Model Evaluation Measures, Machine Learning Algorithms, Pattern Identification, Advanced Statistical Techniques, Linear Regression & Logistic Regression for Big Data, Decision Trees, Classification Rule, K Nearest Neighbor (kNN), Naïve Bayes, Association Rules, K-means, Text Analytics, Outlier Detection. If learners have completed 1 or more of the above Arcitura modules through a different course and have passed the associated exams, then a discount will apply to their tuition and they could skip the delivery of the associated module. Learn how to be an integral part of any modern business by storing, organizing and creating value from its vast amount of data. Increase sales! Improve efficiency! And much more. Upon completion of this big data course, learners will be able to demonstrate proficiency in the design, implementation, and integration of Big Data solutions within the IT enterprise or cloud-based environment. New Big Data Mechanisms, Data Processing Architectural Models, Enterprise Data Warehouse and Big Data Integration Approaches, Architectural Big Data Environments, Cloud Computing & Big Data Architectural Considerations, Advanced Big Data Architecture, Big Data Solution Architectural Layers, Big Data Solution Design Patterns, Big Data Architectural Compound Patterns. If learners have completed one or more of the above Arcitura modules through a different course and have passed the associated exams, then a discount will apply to their tuition and they could skip the delivery of the associated module.